Fabric Mart Fabricistas: Made By A Fabricista: Knit Extravaganza! Made By A Fabricista: Knit Extravaganza! We have been fortunate enough to have four new, talented Fabricistas agree to join us on an ongoing basis at the Fabric Mart Blog! You may already be familiar with all or some of our new contributors as each of them have participated in either this or last year's Fashion Challenge and also have their own blogs. First up we would like to introduce/re-introduce you to Ann from SewBaby. 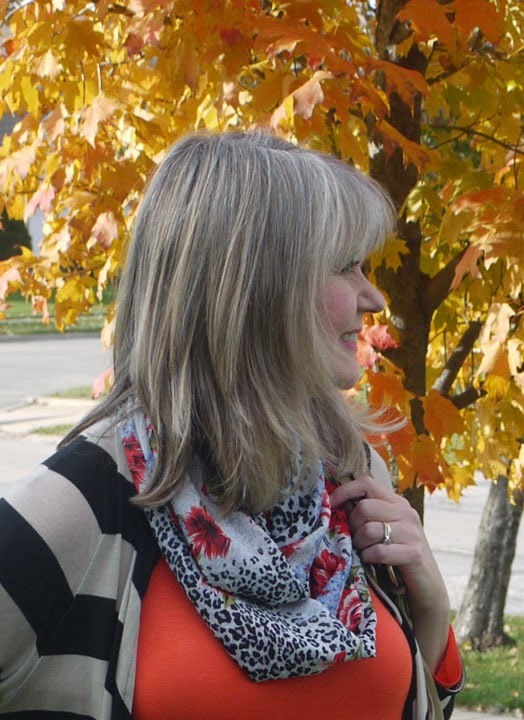 ~I'm so excited to be blogging as a Fabric Mart Fabricista! I've been a Fabric Mart customer since the 90's- before they even had a website! They are always my go-to place for discovering new fabrics at unbeatable prices. Did you catch the flash sale last Thursday on the silk modal knit in driftwood and black stripes? 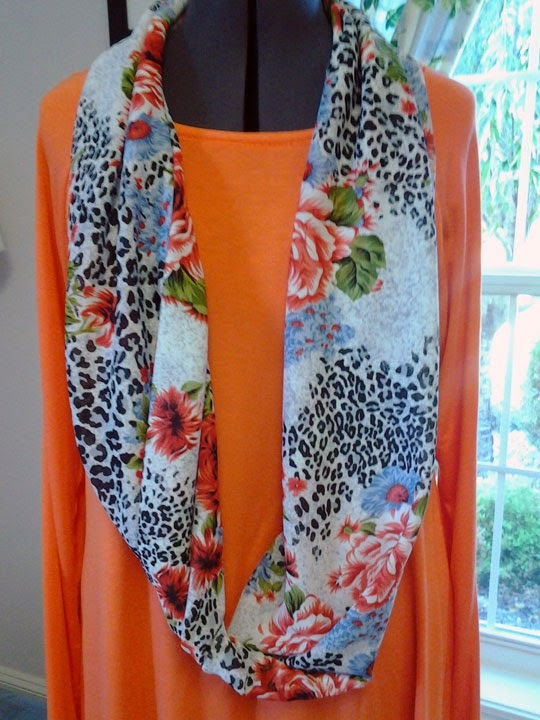 I had ordered some before the sale, and had also ordered the orange/coral silk modal knit. I was curious to see what these knits would be like; as I love silk knits for their brilliant colors and I love modal knits for their incredible softness, so the combination of the two seemed like a match made in heaven. Plus, silk is known for providing warmth without weight, so I thought it could be a nice choice going into chilly weather. Probably because of the time of year, I was originally drawn to the orange/coral, but I could tell it was going to be BRIGHT, and I knew that I would have to wear it with something that would provide some grounding to it. So, in my mind, I started envisioning a coral tunic, topped with a waterfall cardigan. The black and driftwood striped silk/modal knit seemed like the perfect neutral to help ground the brightness of the orange coral. But then, they felt kind of unconnected, so I thought- how about an infinity scarf with both the orange, black and tan shades in it? I searched the Fabric Mart website and found a mesh knit called Crimson Red/Black/Multi Roses and Abstract Animal Print Mesh Netting. I have to say- this would not be a fabric that I would normally pick. Roses and leopard? That's a lot going on, but it did have a little of that really bright orange around the edge of the roses, so I decided to go for it. My vision for this outfit wouldn't be complete without some sort of bottom layer, and I decided with all the rest of the busy-ness of the stripes and scarf print, and brightness going on with the tunic, that I better go very basic with some black ponte leggings. When I got my order, I debated about whether I should wash the silk knits. I didn't want to lose any of the sheen. But I could just see myself spilling BBQ sauce on it the first time I wore it, so I bit the bullet and washed everything. I'm glad that I did because the silk knits did shrink quite a bit. My 2 yard silk modal cuts, ended up being 1-3/4 yard cuts. But the luster was still there! No harm done. 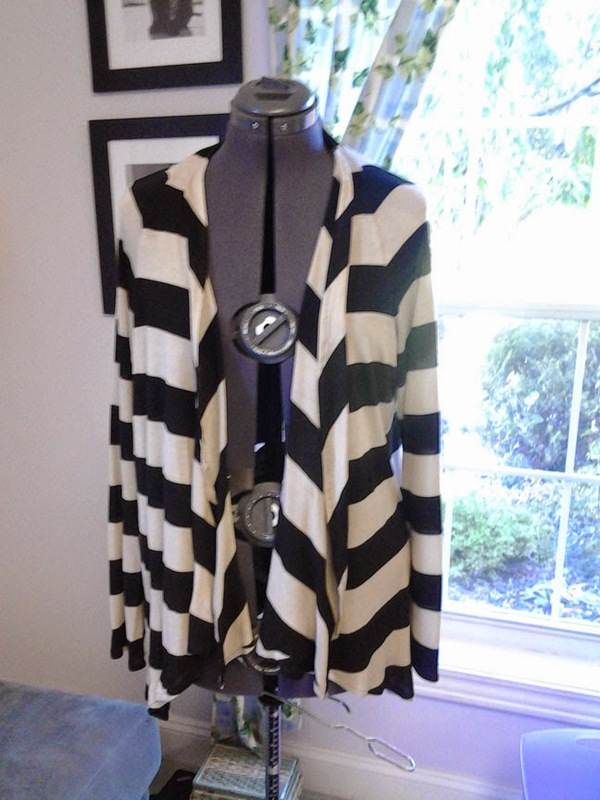 For my patterns, I used Butterick 5789 for the cardigan because it didn't have any side seams, and would eliminate needing to match the stripes there. For the leggings, I used McCall's 7026- a new no-side seam legging pattern. 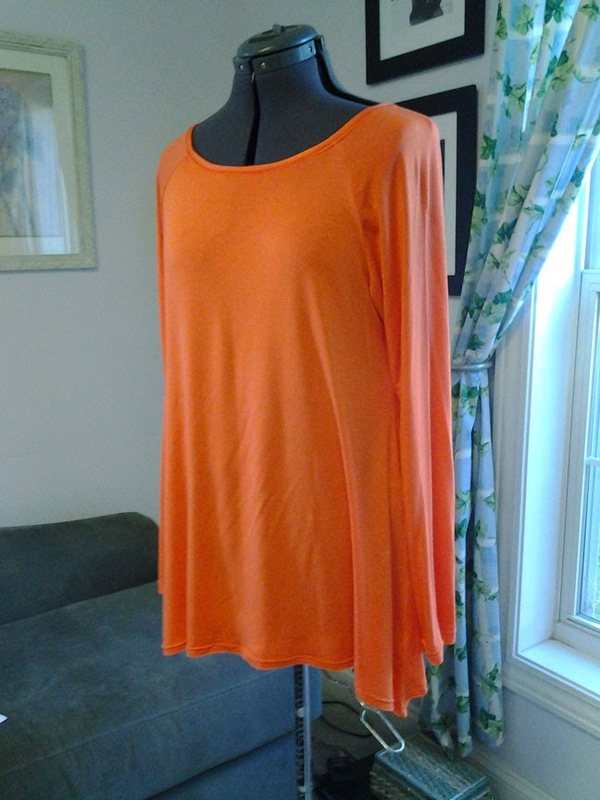 And for the orange shirt, I used Vogue 1261- a raglan tunic with a handkerchief hem. 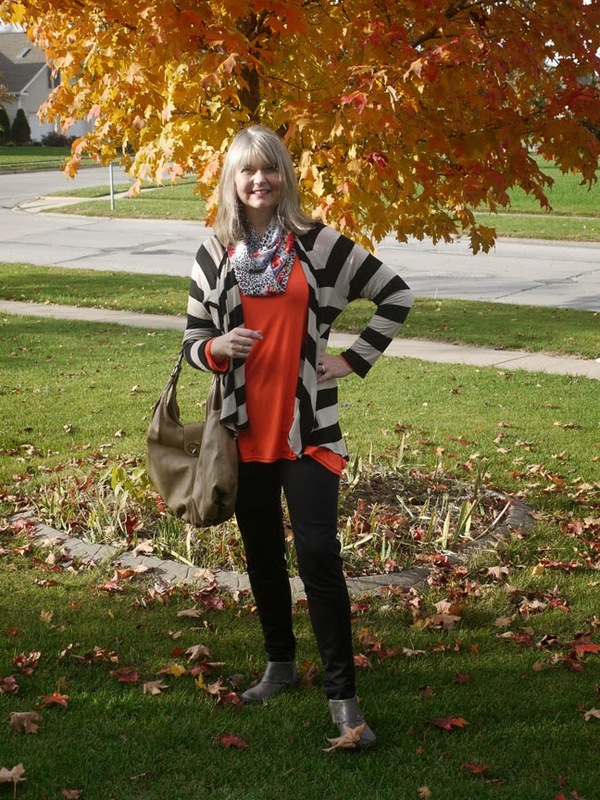 I wanted the orange to peek out below the cardigan at the bottom for just a little pop of color. All of these pieces are super quick to make, and armed with a rotary cutter and serger, I was able to put this outfit together in an afternoon. I do think that anytime you combine orange with black, it's going to be Halloween-ish, which is perfect for this time of year, but I think I'll try the tunic with blue or cream separates to lessen that effect later. But wait- that's not the end of the story! With both the ponte and the mesh, I had enough fabric left over for a BONUS OUTFIT! 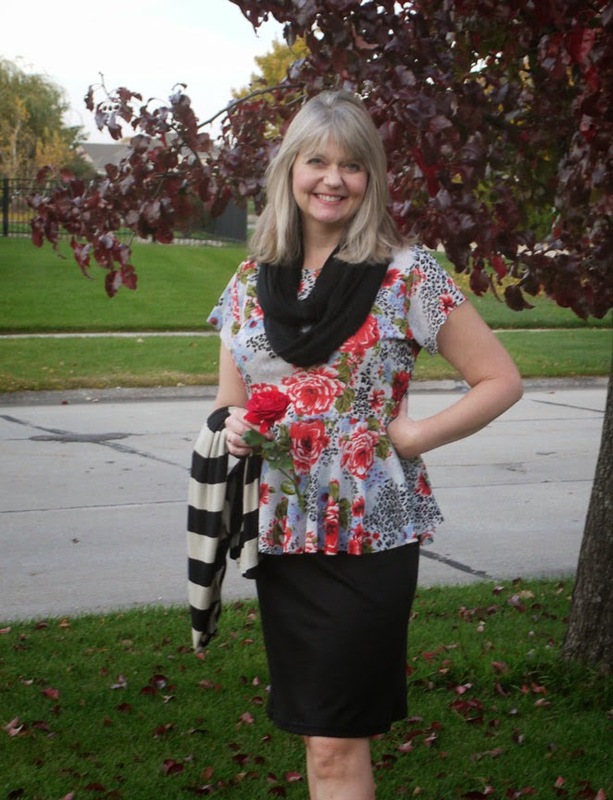 I made a peplum top from McCalls 7021 and a basic knit skirt. I'd never actually made any clothing from mesh knits before, thinking that they would be too thin, but this one was not see through, and was actually super easy to sew. I didn't hem the flounce, as it seemed to lay so nicely as is, and I didn't want to risk rippling it. I'm amazed at how completely different this outfit is from the first, and I may even like it better! I think I'll wear it with a light blue denim jacket and boots when it gets colder. So from my original order of 8 yards of fabric, I got 6 pieces- two tops, pants, skirt, scarf and cardigan. And in choosing really simple patterns, these were really quick to put together. So, if you're looking for some quick and economical wardrobe pieces, try your hand at knits! Thanks so much Ann! We look forward to seeing what you come up with next month! Would you like to be a guest contributor for the Fabric Mart blog? If so please email us at fabricmartblog@gmail.com. I almost bought that fabric and didn't. Darn it! :) I love the entire look Ann! Ann, this is so inspirational. I love all the pieces. 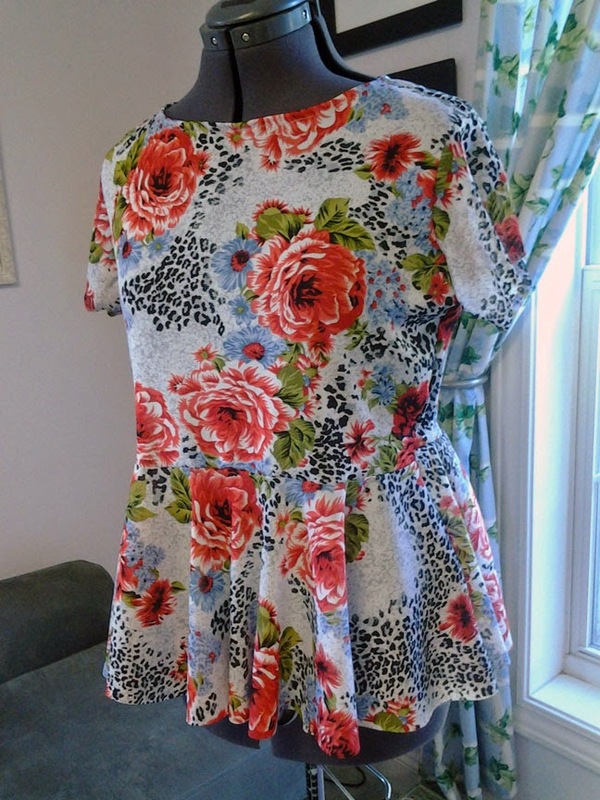 :) I think I *may* have to make that darling peplum top, what an easy, yet flattering style! Great looking garments! Orange is one of my favorite colors. What a fabulous outfit! Love all the elements and love how it works all together. Well done, and nice to see you as a regular now here. Lovely! Lovely! I really love the peplum top too. And that scarf! Everything you made goes well together. Thanks everyone for your kind words! I had a lot of fun making these pieces! Each piece looks fabulous- thanks for sharing! I love all the pieces you are wearing! You look fabulous. But I also LOVE your shoes! What brand are they? Beautiful outfits great job LOVE all the pieces you made !!! !